INLD leader Ajay Singh Chautala along with former HPSC chairman K.C. Bangar claimed that HCS Prel 2009 results were manipulated to give advantage to 21 candidates to appear in mains, they also release names of 11 candidates who are close relatives of HPSC members, bureaucrats and chief minister of Haryana. INLD demanded a probe in the job selection irregularities by a sitting High Court judge. 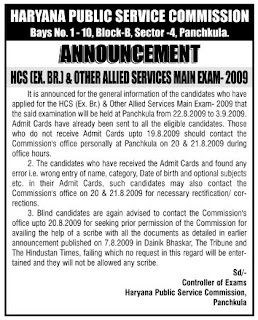 There has also been charges of corruption, nepotism and large scale irregularities in the HPSC selection process so this news only make the already doubtful process more concerns in the mind of genuine candidates who will be appearing in mains from 22nd Aug. 2009 and many of these candidates not got there admit cards yet so for them the following notice may be of some help. Hi Naresh, Hows the HCS exams are going on? Best of luck for the remaining papers if left. Kindly let me know a good GK & GS book based on RAS(P)exam with an emphasis on Rajasthan GK. @ Tushar : thanks buddy. My papers are over and I performed as per my satisfaction, rest depend on the examiner. regarding RAS GK Book : Bhalla and Bhalla : Contemporary Rajasthan, Ashok Chaudhary : Rochak Rajasthan , Laxmi Narayan Nathuramka : Economy of Rajasthan are good to start with.